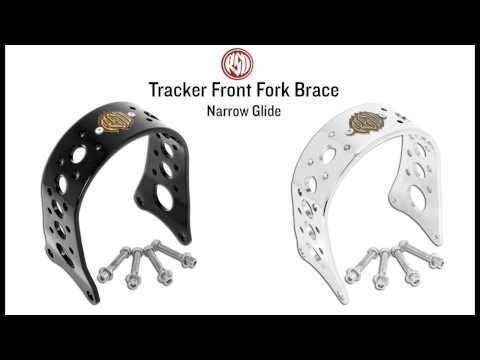 Simplification in the name of function is what the RSD Tracker Harley Narrow Glide Fork Brace is all about. It allows you to get rid of the front fender without losing the integrity of the suspension. Eliminates fork twist and increases rigidity from stock while looking damn good. Available in chrome and black powder coat finish with a riveted brass antique RSD logo badge. You can scotch brite the chrome for a fantastic brushed nickel look.